This show arrives at a tender time in the country’s history, when cultural and ancestral histories feel at risk of erasure or condemnation. Sabur’s work is part of Champions, a West Palm Beach Armory Art Center exhibition. 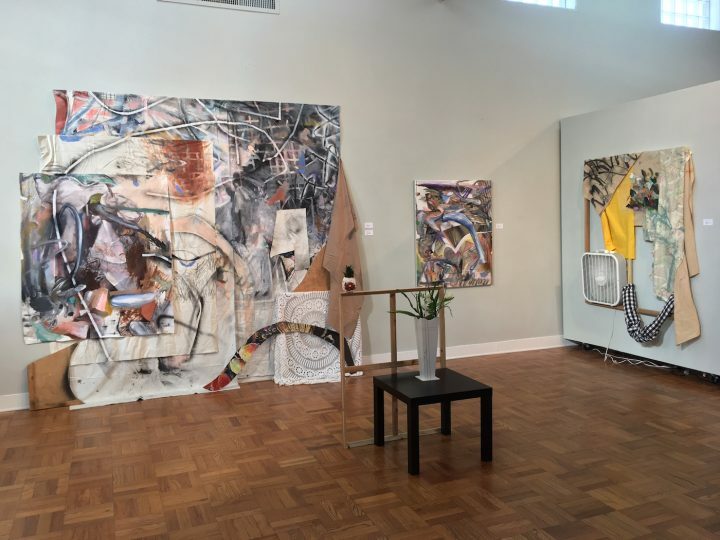 Curated by Jane Hart, it showcases the work of 16 contemporary Caribbean artists, each living in South Florida. 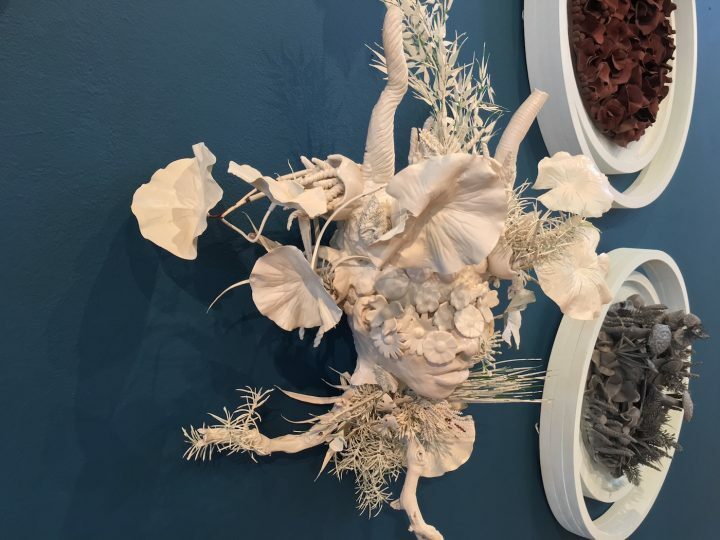 Though not every work is politically charged — in fact, most aren’t — the show arrives at a tender time in the country’s history, when cultural and ancestral histories feel at risk of erasure or condemnation (now as much as — and even more than — before). The artists on view present, in equal measure, the multitudinous nature of their own identities, histories, and the terrains of their birth. The surrealist transformations of Floridian and Caribbean landscapes are especially moving. 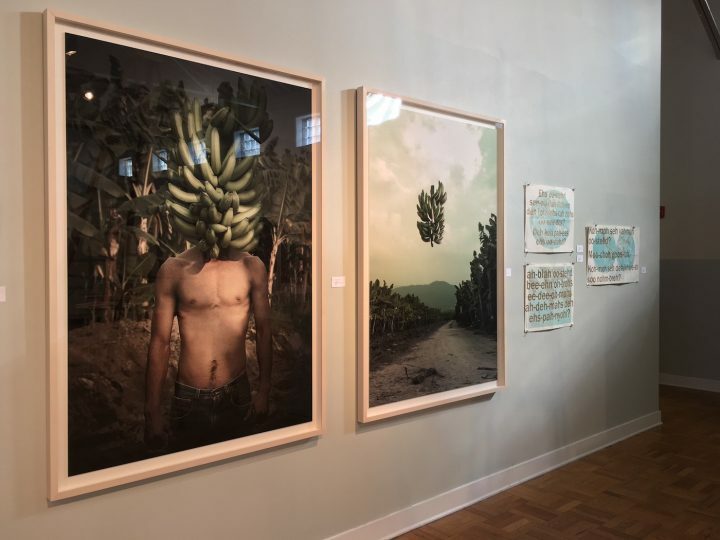 Colombian artist Gonzalo Fuenmayor’s “Genesis XIV,” a photograph of a man with a flourish of bananas for a head, references the “Banana Republic” of his childhood. “Untitled: Maynada Oak” and “Untitled: Maynada Mangoes,” two works by Adler Guerrier, who is of Haitian heritage, have a hypnotic effect. The xeroxed images of the titular subjects are dotted with painted, pastel-colored shapes, like fantastical mangoes themselves. Cuban-born Jessica Martin‘s delicate, coarse, sometimes gold-flecked paintings are mostly small, depicting spaces that may or may not exist. Photographs from Johanne Rahaman’s Black Florida series, recently profiled in The New Yorker, are intimate documentations of South Florida’s black community, capturing people in natural, unposed scenarios. 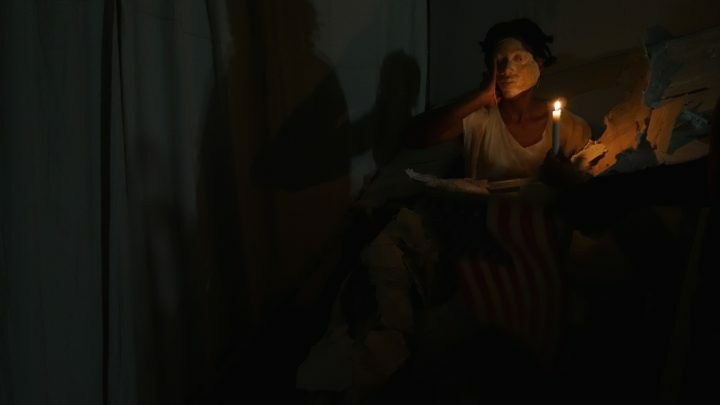 In a striking parallel, Michelle Lisa Polissaint’s photographs from her series, If Home Was Home, were taken in her parents’ hometown of Vieux-Bourg-d’Aquin, Haiti. They explore, rather tenderly, the concept of home and how complicated it becomes across literal oceans. 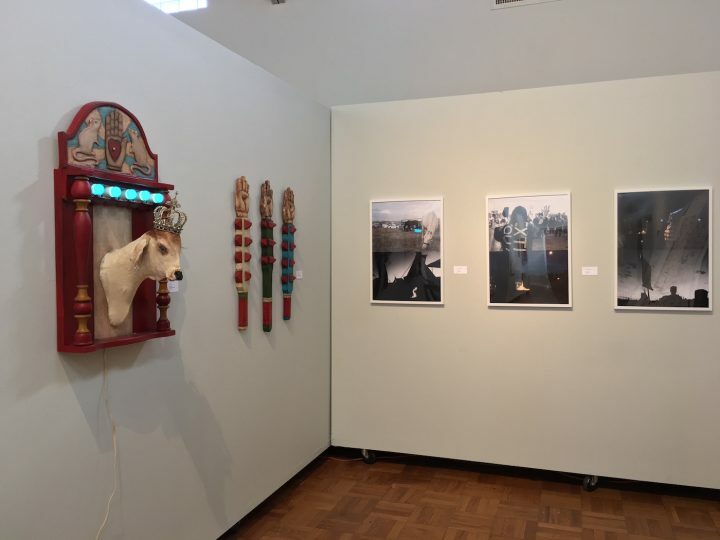 Home is a theme throughout: Damian Rojo’s “Best in Show” (a fake goat’s head crowned and framed like a medieval panel painting) recalls the windows found in the graves of Cuban cemeteries — placed there for souls to peek out. Clara Varas’s massive, mixed media sculptures employ household items, like sheets and chairs, to reference literal displacement. 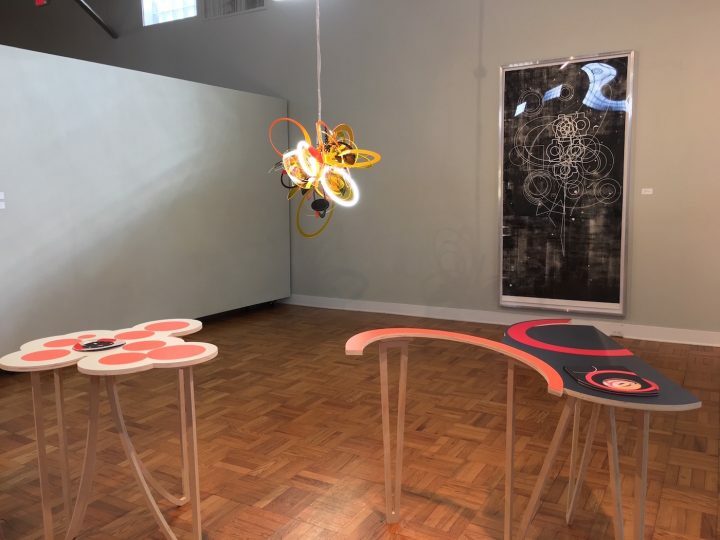 Leyden Rodriguez-Casanova’s “Blinds Inside a Column” felt like a playful intervention in the center of the room: a closet door laying supine and flanked by other items vaguely recalling a table, a wall, a bedroom. 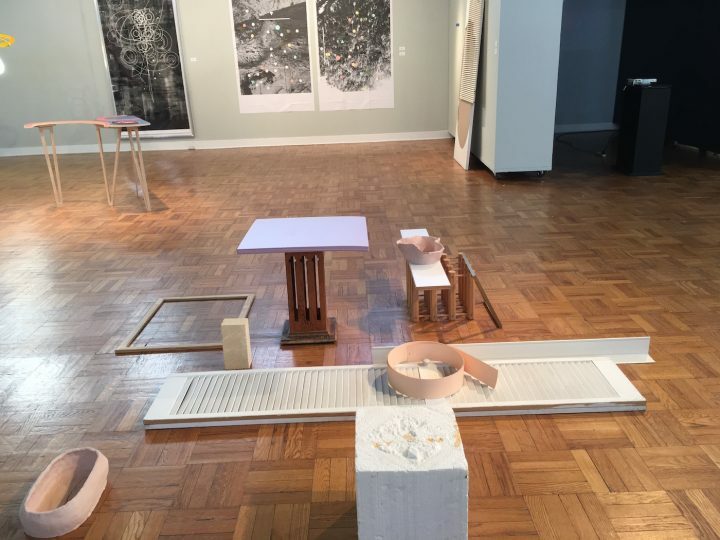 Misael Soto‘s seemingly absent piece took the form of an actual intervention: Hardly noticeable performers moved throughout the space painfully slowly, sometimes sitting on platforms intended for art objects. Being part of any diaspora renders the meaning of home complex; immigrants and their children experience the unique phenomenon of belonging to both the nation they’re from and the place they live — whether they chose to be there or were forced, by dangerous policies at home, to relocate. This liminality is a vital part of the story of the United States, a ventricle in the heart of the nation’s heterogeneous identity. This country has no official language to tell its story, one that’s actually written by multiple hands. 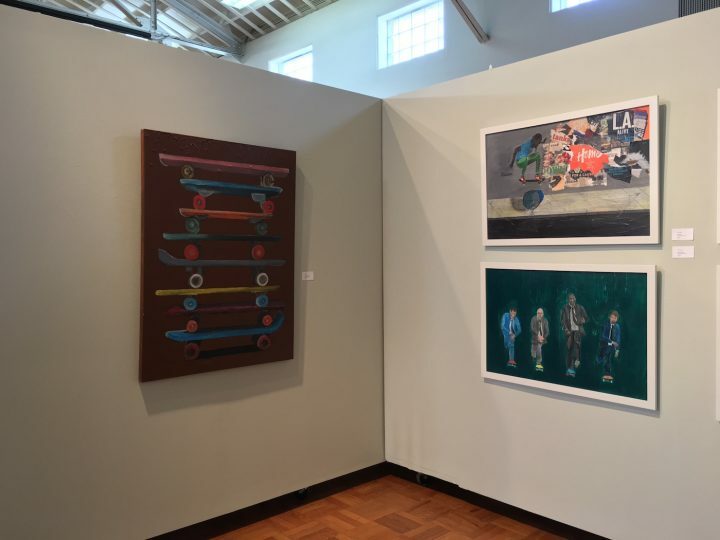 Champions continues at the Armory Art Center (1700 Parker Avenue,West Palm Beach, Florida) through February 11.